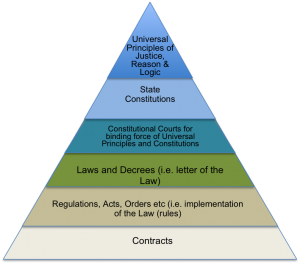 The above Fig.1 illustrates how Universal Principles of Justice, Logic and Reason, expressed in State Constitutions are made binding by Constitutional Courts, overseeing that both the constitutions as well as the letter of the Law and subsequent Rules, Regulations, Orders, Acts and contracts are integrally consistent. This means, that the Rule of Law cannot tolerate, ambiguities and/or any other logical inconsistencies or misrepresentations in contracts. Thus, the Law governing contracts is before all else subject to Principles of Justice that can only be determined through a consistent application of logic and reason. Such that any contract that can be shown to be logically inconsistent, ambiguous or ill defined, cannot be considered valid. proportionality or just measure; impartiality, good faith. Thus, It can be affirmed, that any untrue claims explicit or implied, by commission or omission, that induce a party to enter into a contract, renders that contract invalid and hence null and void. So, when money as an object of a contract is misrepresented, that contract must be considered invalid. it is evident that inherent validity must override all other considerations such that no circumstance such as common or habitual practices can “make valid” that which is invalid. Breaches of this nature provide the conditions for the systematic erosion of the legitimate exercise of fundamental rights and freedoms as the misrepresentation of money, provides for the illegitimate transfer of goods and services in a broad systematic fashion. Law, both natural and human when adopted by a State is known as the Rule of Law and requires being administered in a way that is wholly consistent. The people enjoy security and trust. This often results in unbearable circumstances undermining the recognised universal principles of: equality, freedom, and human dignity, among others. Only the exercise of the right of individual and collective resistance – ultima ratio or last argument or the last resort – can remedy unjust, vile or arbitrary rules. With respect to the question of the definition of money. The definition of money in terms of two mutually exclusive assertions i.e. money as a unit of measure of value as well as a tradable commodity leads to a logical contradiction undermining both assertions. When a State under condoned practices assumes such logical incoherence as valid and, explicitly or implicitly, makes the realisation of either a requirement e.g. measure of value is compulsory, it is requiring or forcing an inconsistent application of its rules as the function of measure cannot be made subject to the limits and constraints applied to commodities. Thus and as of the key object of current money contracts, the inconsistency of the definition of money assumed in practice, violates logical and systematic legal interpretation by directly contravening or inducing to contravene, the higher principles mentioned above.